This module is not playable by itself, but requires ownership of Eastern Front and Road to Berlin to enjoy all of the scenarios. World War II began when German tanks rolled across the border of Poland on September 1st, 1939. The Poles fought back courageously, blunting several attacks, but the force of numbers and superior weapons drove them back toward Warsaw. On the 14th, a Polish counter-offensive broke down after hard fighting, as the slower Polish infantry divisions found themselves out-maneuvered by the faster German panzer formations. Still fighting, the Polish armies fell back toward the southeast to await their Allies' offensive, but on the 17th the Soviet Union launched its own treacherous attack. Fighting would continue into October, but the Polish state was doomed. 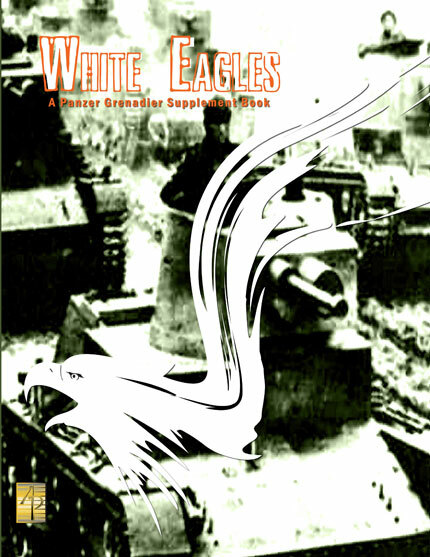 White Eagles is a 76-page book supplement to the Panzer Grenadier series, focused on the battles of September 1939, between Poland's defenders and the German and Soviet invaders. There are 40 new scenarios depicting both sides on the attack, battles of cavalry against cavalry, and even a tank battle or two. Plus of course background articles on the armies and weapons involved. This module is not playable by itself, but requires ownership of Eastern Front and Road to Berlin to enjoy all of the scenarios. White Eagles includes 165 die-cut and mounted playing pieces. Almost all of them represent Polish forces: tanks, cavalry, armored cars, infantry, machine gun, mortar, anti-tank, artillery and of course leaders. The book's format is the same as our very popular Sinister Forces and Fronte Russo books.